Blazing a trail for safely integrating drones into the national airspace, a team from NASA’s Ames Research Center on Oct. 19 flew four uncrewed aircraft – commonly called drones – at Reno-Stead Airport in Reno, Nevada. The “out of sight” tests, led by NASA in coordination with the Federal Aviation Administration and several partners, were the latest waypoint in solving the challenge of drones flying beyond the visual line of sight of their human operators without endangering other aircraft. They were part of NASA’s Unmanned Aircraft Systems (UAS) traffic management (UTM) research platform, led by Dr. Parimal Kopardekar, manager of NASA’s Safe Autonomous Systems Operations project and senior engineer for Air Transportation Systems at Ames. NASA is with you when you fly, committed to transforming aviation by reducing its environmental impact, maintaining safety, and revolutionizing aircraft shapes and propulsion. Every U.S. aircraft and U.S. air traffic control tower has NASA-developed technology on board. Ames Research Center originally was part of NASA’s precursor, the National Advisory Committee for Aeronautics, which shaped the first 100 years of aviation in America. During the test, two of the drones flew beyond their commanders’ lines of sight. As many as two drones were operated in the same test airspace, separated by altitude and within sight of their operators. The pilots used the NASA-developed UTM research platform to gain information about all the drones’ locations and proximity to other air traffic and hazards. UTM also informed other airspace users of potential hazards and conflicting operations that could affect their plans. Before multiple drones can fly in the same area, beyond the pilots’ view, procedures need to be in place to safely manage the traffic. Operators must be aware of other aircraft around them, no-fly zones (also known as geo-fenced areas), and man-made and natural hazards, such as severe weather or unanticipated events in the area. 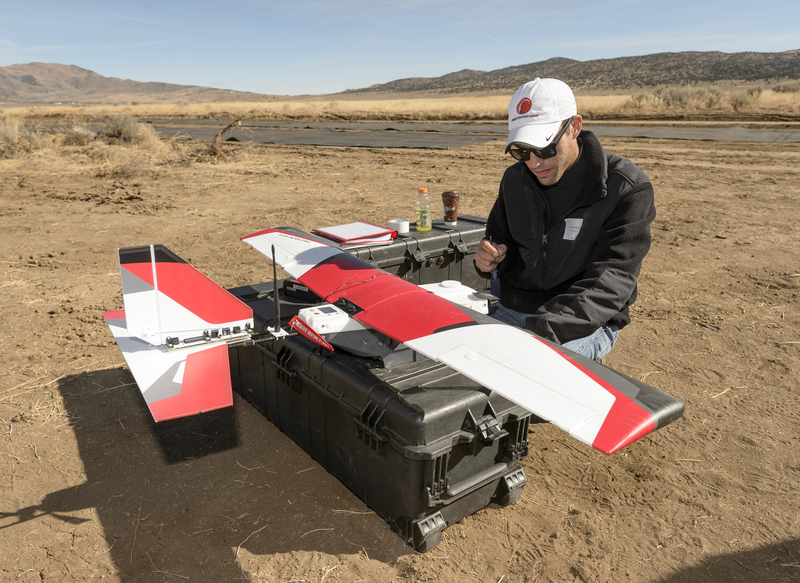 UTM partners used various unmanned aircraft connected to the research platform to test UAS operations allowing NASA and the FAA to refine and develop the research. Additional observers kept a sharp eye on every vehicle to ensure safe operations even when the drones were out of sight of the operator-in-command. When three of the drones flew close together, they were within view of their operators. Current FAA regulations require that drone operators are able to see any other aircraft in order to avoid them, which limits many potential applications for drone technology. The UTM demonstration will help regulators and researchers assess the capabilities and procedures that could support operations beyond operators’ visual lines of sight. The operators also used common data exchange protocols — developed jointly by NASA, the FAA and industry — to flag their intended use of the airspace stay aware of any real-time constraints. First UTM demonstration of multiple drones flying beyond visual line of sight of the pilot, with paths separated by altitude. This used the UTM research platform for information about potential hazards and conflicting operations. First demonstration of prioritizing airspace access for emergency response drones through UTM airspace management combined with notification of other UAS operators to clear the area. First demonstration of system detect-and-alert capabilities. Live radar and weather systems provided alerts to UTM operators based on real data measurements. The team also introduced simulated weather events, such as high winds, to obtain operator feedback and further refine the capability. Enhanced demonstration of automated alert when aircraft are not conforming to their flight plans. This safety feature warns UAS operators and, in future, FAA systems of these hazards, such as a drone flying away from its planned path or loss of connection with an operator. First demonstration of dynamic re-routing capability that allows an unmanned, airborne vehicle to request flight plan changes. This function allows operators to update their missions in response to either changing airspace conditions or new mission objectives. Previous flight tests by engineers from NASA’s Ames Research Center, located in California’s Silicon Valley, have expanded development and evaluated requirements needed to make low-altitude drone operations safe and efficient. In April 2016, NASA and operators from several FAA drone test sites across the country flew 22 uncrewed aircraft simultaneously, the first and largest demonstration of its kind, to assess rural operations of NASA’s UTM research platform. In November 2015, NASA’s UTM team field-tested rural UAS operations with drones operating in separated flight areas that pilots reserved using the UTM research platform. With the most recent tests complete, NASA now will offer the capabilities to all FAA test sites for further validation and assessment. UTM’s Technical Capability Level Three testing is planned for January 2018 and will involve evaluating tracking procedures for managing cooperative and uncooperative drones to ensure collective safety of manned and unmanned operations over moderately populated areas. Technical Capability Level Four, planned for 2019, will involve higher-density urban areas for autonomous vehicles used for newsgathering and package delivery, and will offer large-scale contingency mitigation. Collaborators for the October tests included: Aerovironment, Inc., Monrovia, California; Alaska Center of UAS Integration, Fairbanks, Alaska; Drone Co-Habitation Services, Wilmington, Delaware; Gryphon Sensors, Syracuse, New York; Lone Star UAS Center, Corpus Christi, Texas; Modern Technology Solutions Inc., Alexandria, Virginia; Nevada Institute of Autonomous Systems, Reno, Nevada; Precision Hawk, Raleigh, North Carolina; Proxy Technologies, Reston, Virginia; Silent Falcon, Albuquerque, New Mexico; SmartC2, Grand Forks, North Dakota; University of Nevada-Reno, Reno, Nevada, and Unmanned Experts, Denver, Colorado.